There was a big setback though. My Samsung Galaxy SII decided to go mental on me. The phone keeps rebooting automatically and has clearly some issues with the apps constantly. This is a major issue since I use this phone a lot to make instant updates and to navigate via Google maps. I decided not to panic and visit a Samsung service center once I reach Hanoi. I really hope they can fix it and I pray to god that my pictures and videos will still be acccessible. Clinton solved the navigation issue directly by pulling out an 'oldschool' paper map of Vietnam. The updating bit will stay a problem but I'll try to keep writing daily updates on this blog. Really trying to turn this into a habbit. Anyway, we headed off and I have to say Clinton is one strong tandem buddy! 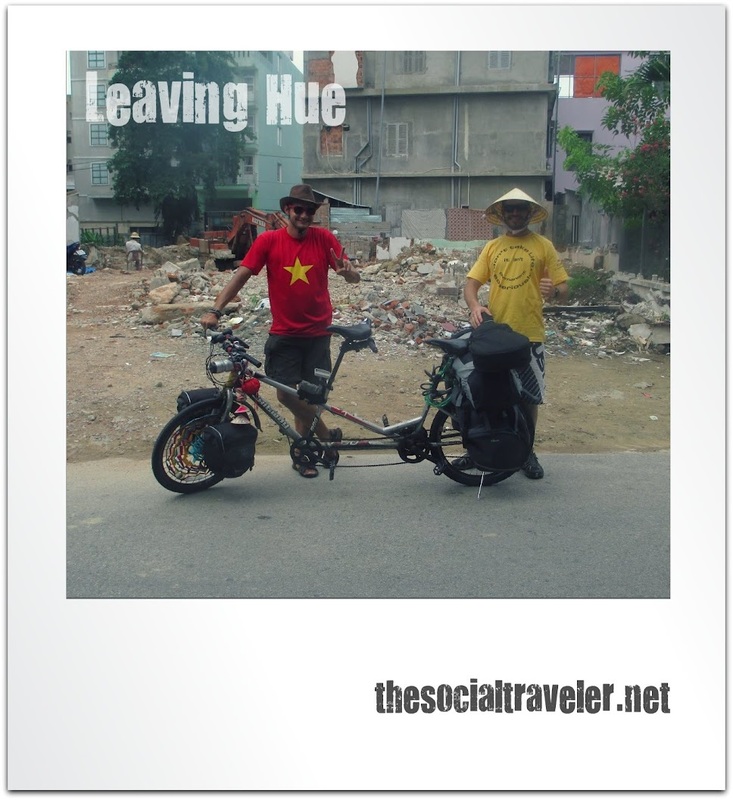 It took a little while to adjust to each other and the bike but once that was done we bolted out of Hue and did about 45 km just in about 1,5 hour. AWESOME!!! After this effort we started to get problems with the chain. OMG that's ages ago. The past weeks it was mainly tire probs to my big surprise. I guess my Cambodian bikeshop hero really got the front gear properly fixed. Now it was just the chain that got loose because of the many kms it's been going without any probs. Anyway, we decided to stop at the first bikeshop and replace the chain with a new one. We had a few pictures taken of us by locals while the chain was been replaced and after some bargaining for the price we headed of for our final kms of the day. We choose Dong Ha as our resting place after a fair 70 km ride. Tomorrow we'll start early in the morning and we'll try to get a bit further.